The yen is starting to recover from its multiyear slide -- and that's great news for Hawaiian Airlines. In late 2010, Hawaiian Holdings (NASDAQ:HA) began a multiyear international expansion. Japan was the main focus of this growth, as the top source of foreign visitors to Hawaii. Japan has become a major market for Hawaiian Airlines. Image source: Wikimedia Commons. Hawaiian Airlines' foray into the market was very successful, and within two years of launching its first flights to Tokyo, it was offering 24 weekly flights to four cities in Japan. However, beginning in late 2012, it was punished by the sharp decline of the Japanese yen relative to the U.S. dollar. The weak yen has also hurt other airlines with big operations in Japan, most notably Delta Air Lines (NYSE:DAL). However, Hawaiian was clearly the biggest casualty of the yen's fall between late 2012 and early 2015. That also makes it the biggest potential beneficiary if the yen stages a turnaround, which has recently started to happen. 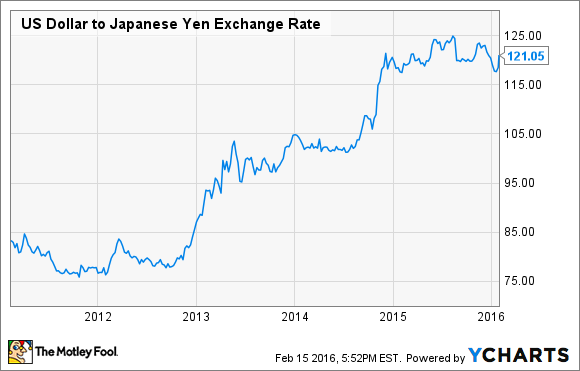 U.S. dollar to Japanese yen exchange rate, data by YCharts. As of the end of 2012, roughly 15%-20% of Hawaiian Holdings' revenue was yen-denominated. This meant that by mid-2013, the weaker yen had an annualized negative impact of about $50 million on revenue, including Hawaiian's hedging gains. This represented a pretax margin headwind of more than 2 percentage points. The exchange rate stabilized around 100 yen/dollar from mid-2013 through mid-2014, but in the second half of 2014, the yen plunged again. By the end of 2014, the exchange rate had reached 120 yen/dollar -- and it remained near that level throughout 2015. This put more pressure on Hawaiian's international revenue. Luckily, its profit margin was protected this time around by the simultaneous decline in oil prices. Delta Air Lines faced the second-biggest impact from the weakening yen among U.S. carriers, as it operates a small hub in Tokyo. However, as of late 2012, Delta got only 11% of its revenue from the entire transpacific market, which doesn't just include Japan. Additionally, some of this revenue is dollar-denominated. Thus, Delta has faced a much smaller revenue impact from the weakening yen than Hawaiian Airlines. It has also benefited from an offsetting reduction in its yen-denominated costs. Finally, Delta had hedged very aggressively to protect itself against a potential yen decline. Even with all of these offsetting factors, Delta was forced to retrench in Japan. It has repeatedly cut capacity there, with a particular focus on intra-Asia routes and beach market routes that carry a high proportion of Japanese travelers (and thus primarily generate yen-denominated revenue). Delta has repeatedly cut capacity in Japan because of the yen's decline. By contrast, Hawaiian Airlines' lower cost structure has allowed it to absorb most of the revenue hit from the weak yen. It made one big change by dropping its underperforming daily flights to Fukuoka in mid-2014, but otherwise it hasn't significantly cut capacity in the market. This means that companies like Hawaiian Holdings and Delta Air Lines are getting some much-needed relief. Whereas they were facing significant revenue headwinds from the weakening yen as recently as last quarter, they could benefit from a strengthening yen in the current quarter and beyond. The impact will be biggest for Hawaiian, both because of its larger yen exposure and because Delta was still benefiting from substantial currency hedging gains last year. For Hawaiian Holdings, the yen's newfound strength could not have come at a better time. The carrier plans to expand in Japan later this year, launching flights to Narita International Airport near Tokyo during July. (Hawaiian already serves Tokyo's other airport.) A stronger yen will make those flights more profitable. Thus, Hawaiian Holdings investors hope to see the yen continue rising. Analysts at Barclays recently argued that the yen could move as high as 95/dollar by the end of the year. If that bullish forecast is even close to accurate, Hawaiian Airlines is about to receive a huge windfall. Other airlines like Delta will benefit from a stronger yen, too, but to a much smaller extent.